When you are lucky enough to fall in love, the day may come that you both decide to spend the rest of your days together. A proposal happens, followed by an engagement. Eventually, though, you have to actually tie the knot, which means choosing where to get married. While some spots, like Hawaii, Colorado, and Florida often prove to be top choices for unions, don’t rule out the Northeast. Keep reading to learn 3 reasons to get married in New England, and why you should have your big day take place in this region. 1) The climate is perfect, depending on the season you decide to get married in. Late spring and early summer are very popular for weddings, especially outdoor weddings. New England is full of picturesque settings, from seaside beaches to mountaintop vistas, all of which can provide a memorable and photogenic location for your day of marital bliss. Beaver Pond and Jackson Falls are just a 5 minute walk from the Christmas Farm Inn & Spa, while the famous “kissing bridge” built in 1876 crosses Jackson’s Ellis River. Further advantages found in New England are due to the latitude. New England states get to avoid the humidity often found in the South. Also, being so far north, New England summer days are long, with sunlight well into the evening. 2) Transportation for family and guests is easy. New England features a multitude of major cities, so there are a ton of airports that people can fly in and out of to get to your wedding. The urban centers are also very close together, so travel between cities does not take very long. Train transportation is also very robust in this region, for those that do not want to fly or drive. It’s possible to save money also by flying into a nearby city rather than the one of the wedding and then coming in the last leg of a trip by land. The Christmas Farm Inn’s wide array of guest rooms can accommodate a total of 125 guests, plus there is complimentary full American breakfast, a Spa, Restaurant and Pub, Fitness Center, and pools. 3) Honeymoon options abound in New England. While the region is great for having a wedding, it’s also a great place to spend the first week or two of your wedding. You can get a quiet cabin the wilderness of Maine, explore the cliffs overhanging the Atlantic coast, or explore the mountains of New Hampshire and Vermont. For a time in another language and culture, Quebec is a short drive away. Boston is sometimes a summer cruise ship terminal with ships heading south to Bermuda and the Bahamas, but also north to ports in Canada. The truly adventurous can even find flights up to Greenland and Iceland, although London is only a few hours’ flight from here too, opening up access to Europe. As you can see, there are 3 great reasons to get married in the states that make the region of New England. The long sunny summer and spring days without humidity but full of memorable locations are well within reach of family and friends who can take advantage of a multitude of transportation options. You and your soon to be spouse will also find a plethora of diverse honeymoon options not too far away. This is a guest post by Mark Wilcox. 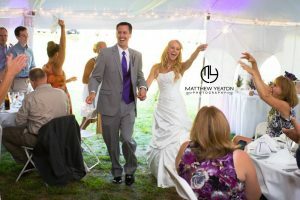 He’s the founder of http://www.weddingintro.com/ which helps brides reduce their stress by providing simple and clear wedding planning information.